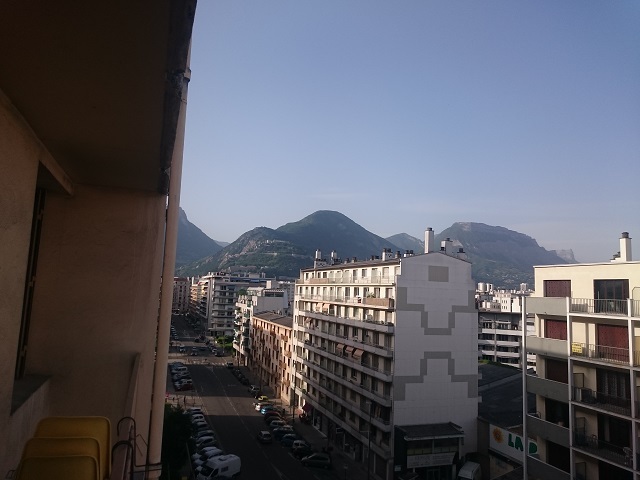 Our second day in Grenoble began a lot like our first, with a gorgeous view of the Alps. If there’s one thing I’ll always remember from this trip it’s walking out onto a balcony every morning and seeing snow capped mountains. Simple gorgeous and how could you not be excited seeing a view like this in the morning. Surrounded by views like this, I’m surprised they get much done in Grenoble other than taking lovely walks in the mountains or the old town and eating wonderful mountain cuisine. Today Hana’s cousin had to go to work, We’d arrived on Wednesday afternoon and Thursday had been a bank-holiday kinda thing in France but Friday was a normal work day, so we were going to be left to our own devices for the day. 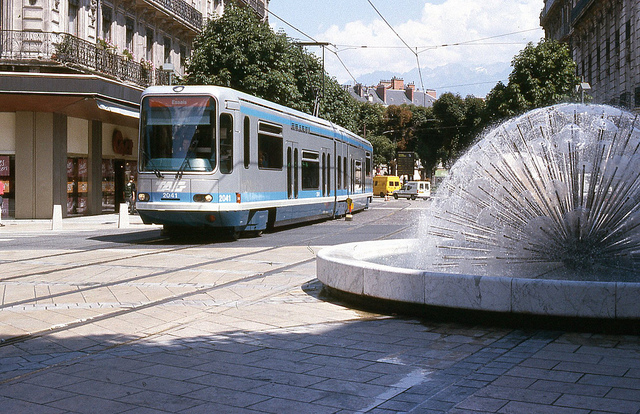 We had seen a few things we’d like to see but settled on visiting the Museum of Grenoble and then taking a wander around the town itself to get a bit more acquainted with this little lovely mountain city. After a lazy start to the day we made our way into town and the museum via the tram network. I love a city with trams. There is such a continental feel to them, they just add something extra to a place. 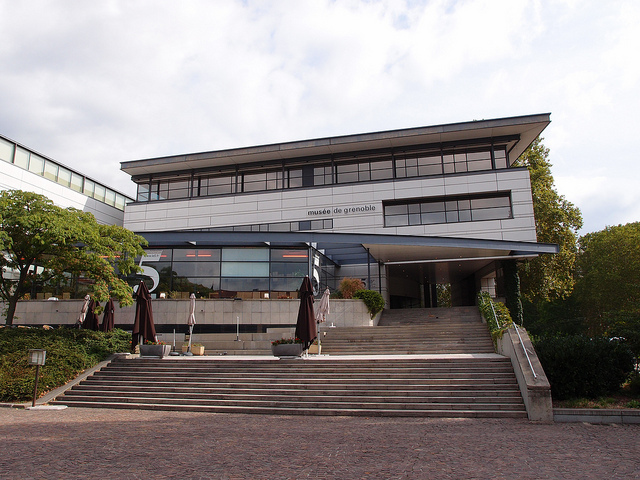 The Museum of Grenoble (Musée de Grenoble) has a collection of fine art from various periods and from around the world. The museum blends ancient world art from Egypt, Greece and Rome with modern and contemporary art by Picasso and Warhol. The present museum opened in the mid-90’s and, architecturally it is an interesting building and I really like the look of it. From inside and out the museum still looks as crisp and modern twenty years later as it would have done on its opening day. We saw both the current exhibition based around Picasso and Warhol (May 7th – August 31st 2015) and part of the permanent collection. The museum opened way back in 1800 and was one of the first provincial art museums. Personally, we both preferred the permanent collection to the current exhibition. You’ll see some works by the French masters hiding around a corner or two which was a nice find. 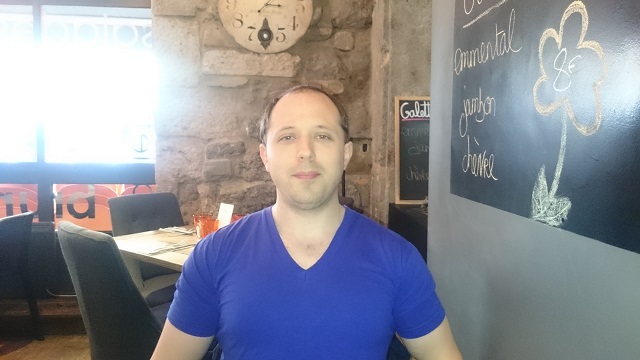 After exploring the museum it was time to refill and I decided I needed to get some more French food into me! 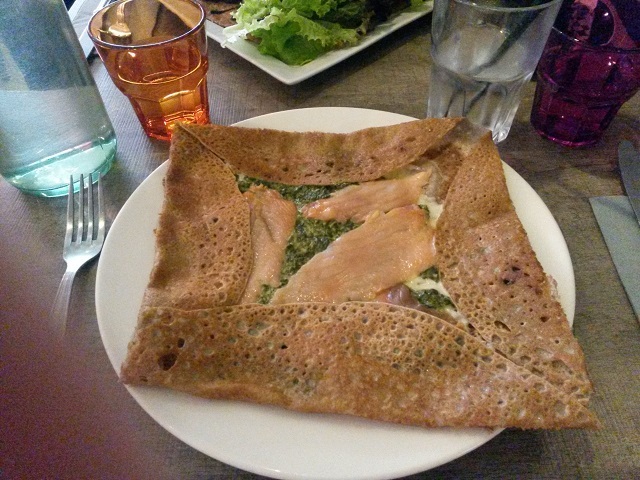 Just down the street from the museum, on Rue Frédéric Taulier is So Krep which is a lovely little creperie. 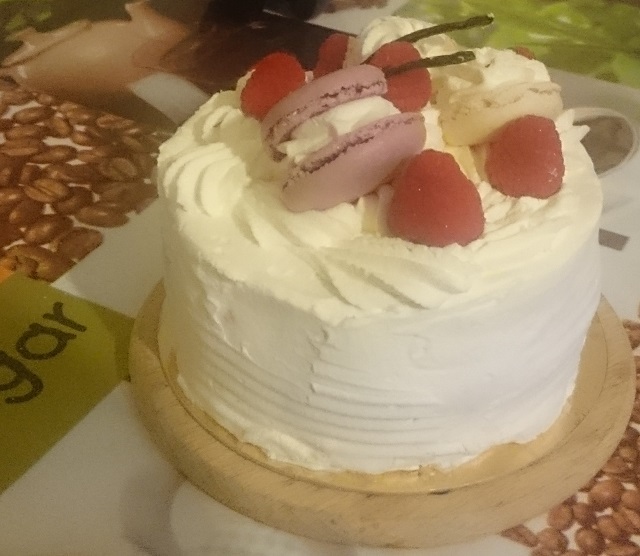 I had to choose something which felt very ‘French’, which would be filling and elegant. So I went for crepe steak hache avec oeuf. 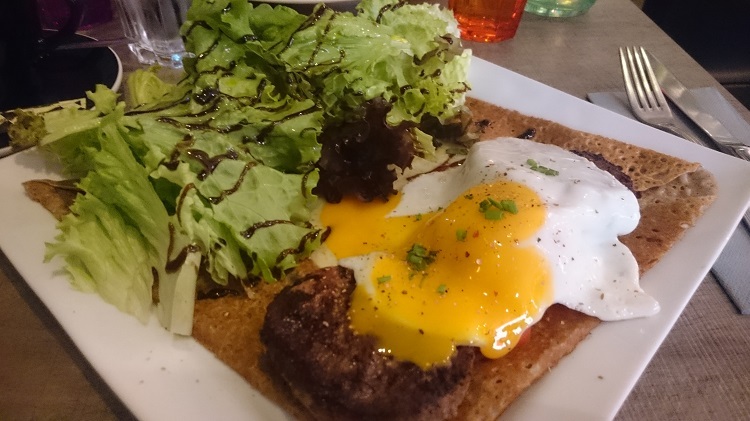 Or a crepe with a fried egg, two steak burgers cooked beautifully rare and a little salad. This might not sound a classic or classy dish if you’re used to burgers elsewhere but in France they do it just a little differently. It is made of ground steak and treated like a steak, served at your choice of rare, medium or well done. On our way back to the flat for a super feast of a dish cooked by Hana’s cousin we stopped off and picked up a frozen icecream cake. This (below) was what we had for dinner, and yes it is very huge and very tasty! The dish is called Maqluba. It is a traditional Arabic dish which is served and made in different ways across the Middle-East. The version we had was the traditional Syrian recipe which Hana’s cousin had grown up eating and which Hana has had a few times to, prepared by her mum. 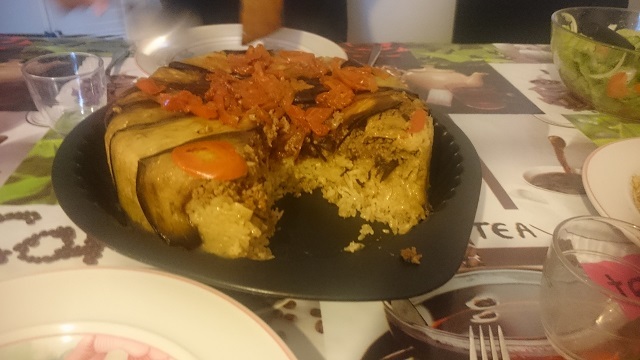 I really loved the combination of tender and gently spiced meats mixed with soft, fluffy rice encased in aubergine and tomatoes. Opening hours Every day except Tuesday, from 10:00 a.m. to 6:30 p.m.